Binance has completed its system upgrade and we expect all trading activity to resume at 10:00 AM (UTC). In the 60 minutes prior to the commencement of trading, users will be able to cancel orders, process deposits, withdrawals, and use all other account related functions. 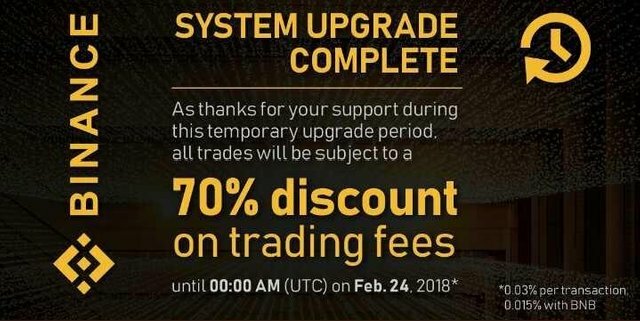 To show our gratitude for your unwavering support throughout the upgrade process, Binance will provide all users with a 70% discount on trading fees (0.03% on all trades, 0.015% with BNB) until 2018/02/24 00:00 AM (UTC).